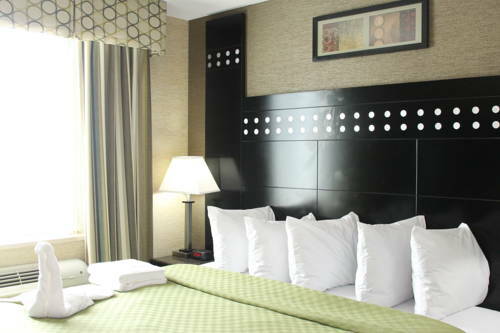 A good night and a great savings await you at the Rodeway Inn Bronx Zoo hotel in Bronx, NY. Our hotel is close to attractions like New Yankee Stadium, LaGuardia Airport, Central Park, Times Square and Citi Field. Enjoy our amenities like free breakfast, free WiFi, a fitness center, a computer, access to copy and fax services and more. Our fresh, clean rooms offer flat-screen TVs, coffee makers, desks, refrigerators, hair dryers, irons and ironing boards. Also, earn rewards including free nights and gift cards with our Choice Privileges Rewards program. Our hotel has limited free parking available. Parking is available on first come, first served basis. Discounted parking available near by.